While a general practitioner can treat many common ailments of the central nervous system, neurology clinical trials study those disorders that are more serious and advanced.You will most likely be sent to a neurologist for things like Alzheimer’s disease, migraine headaches, Parkinson’s disease, and Postherpetic neuralgia. Other subfields that neurologists may focus on include dementia, epilepsy, sleep disorders, and multiple sclerosis. Neurology uses neurological exams to test a person’s mental status and to see how their cranial nerves function. During diagnosis their reflexes and sensations may also be tested. There is a somewhat controversial up and coming area of neurology called cosmetic neurology. This aims to improve a person’s efficiency and ability to learn. There are ongoing neurology clinical trials that you can participate in if you qualify. Neurology is the study of disorders of the nervous system. Neurologists diagnose and treat conditions that adversely affect the central, peripheral and autonomic nervous systems including the blood vessels and muscles that cover those systems. Surgeons who deal with these disorders are known as neurosurgeons. Neurologists may conduct research or treat patients. There is some crossover with the treatment of head trauma and the field of psychiatry. 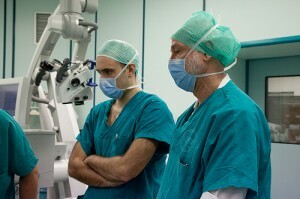 More recently neurology has expanded to treat stroke victims. Disorders that neurology commonly deals with include Alzheimer’s disease, migraine headaches, Parkinson’s disease, and Postherpetic neuralgia. Clinical neuropsychologists are a specialty of neurology that can help evaluate the relationship between the brain and behavior to help plan rehabilitation.